Whether you need to furnish your game with clubs, balls and gloves or are in need of a custom club fitting, you can find it all in our golf shop. Our competitive prices ensure that high quality golfing equipment and apparel are always within your means. Stop in for a visit and pick up some new merch today! Fill up after a round with snacks, beverages, breakfast, lunch and dinner from the experienced chefs in our grille. Relax in our air conditioned clubhouse or dine outdoors on the deck overlooking the ninth hole. A beverage cart is available on the course during our peak periods. Snacks and beverages – for golfers on the run! Interested in attending a Chicopee Country Club event? Give us a call at your convenience for more information, or to get your season pass! 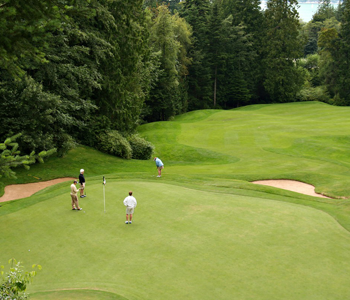 Our staff looks forward to seeing you out on the green. Call 413-594-9294 to book a tournament dinner.